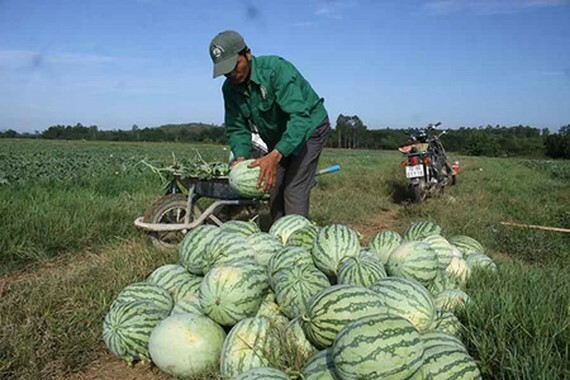 For the very first time, farmers in Binh Son district in the central province of Quang Ngai harvested their first organic seedless watermelon crop. Farmers piloted to grow seedless watermelon in three hectare with productivity of 20 tons per hectare. Their produce is welcomed in the market so farmers are very happy. Early May, farmers ran off their feet to harvest the crop. This year, farmer Nguyen Thi Bich in Binh Thanh Tay Commune planted the new melon in 3,000 square meter. She started growing in February and it took 20 days to fertilize and watering as per instruction. “The watermelon tree rarely catches disease; therefore, we didn’t use pesticide but just biological fertilizer to increase its resistance.” , said Mrs. Bich. Seedless watermelon each weighs 7-8 kilogram. She harvested five tons while a kilogram of melon was being sold at VND7,000-8,000. She earned nearly VND40 million ($1,756) a crop. 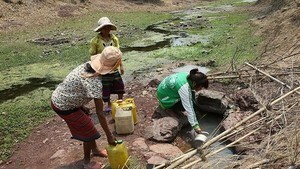 Farmer Nguyen The Cuong in the same commune who 1,000 square meter seedless melon harvested nearly two tons of the fruit. He netted VND10 million. Growing seedless watermelon model was piloted in Binh Son District with the participation of six households. Head of the Department of Agriculture and Rural Development in Binh Son District Pham Hong Nguyen said participant farmers are supported seed, bio-fertilizer, organic fertilizer, and the devices. Their produce will be displayed in supermarkets and retail stores in the province.